If the traveler wants to escape the noises of Ho Chi Minh City, Can Gio where not far from the city will be an ideal place to discover with the private tour Saigon during your Travel Indochina Vietnam. The travelers can’t image that this interesting destination contains how many wonderful things waiting. Coming to Can Gio, having a lot of activities that the traveler can’t miss like visiting the Monkey Island, discovering the mangrove and so on. To start this wonderful experience, the first thing requiring the traveler have to choose is pick up the vehicle type to move. Because from Ho Chi Minh City to Can Gio distance isn’t a little long so the traveler can get there by three ways: motorbike, bus or tour. For the motorbike option, spending about 1.5 hours to drive but along the way to get Can Gio travelers can drop by anywhere who want. This is an exciting point when choosing move by motorbike. Another safe option is by bus because of the convenience and the cost saving for the tour. All the things need to do is catch bus number 20 with fee is 20.000 VND for one turn per one local person or one foreigner. If visitors want to travel follow the tour, a short journey together the company or the team will become perfect more when booking at the best Indochina tours in 2018 with a good price. The following recommendation is the ways to get to Can Gio and the choosing decision what transport will depend on: What you want and How much expense you want to spend on the trip. When arriving at Can Gio District, Monkey island promised is an amazing destination for visitors even for any grumpy visitors. Coming from Ho Chi Minh City, Monkey Island is to the right of the main road, about 34km past the ferry. This island is the house at least a hundred wild but unafraid simians together the diversity of vegetational cover. If tourists first get there, they will feel extremely impress with the monkey view appears everywhere. In addition to, beyond the expectation because there are a lot of babe monkeys and ones are so cute. Travelers to Can Gio will dip themselves to the truly unspoiled destination, or rather is to experience the vast mangrove forest and monkeys. An important notice when tourists come to Monkey Island keeps a firm hold on the possessions away monkeys. Monkeys in Island are little naughty and they sometimes swipe at the ankles, try to grab the ponytail or steal food or drink from tourists. Moreover, be sure to take plenty of insect repellent and sunscreen. All of this trip things at the private tour Sai Gon. On Monkey Island, besides playing with monkeys and enjoying the fresh air, visitors are advised to visit the Rung Sac Revolutionary Base which represents a page of national history and an animal circus with tamed and untamed beasts, including crocodiles, excites visitors. At the reconstructed base, dummies portray VC cadres sawing open unexploded American bombs in order to salvage the explosives, and wrestling with crocodiles, which were once common here but are now confined to crocodile farms like the one by the entrance. A small museum has wildlife displays, along with exhibits relating to local war history and archaeological finds. Can Gio Mangrove Forest, one of the Biosphere Reserve recognized by UNESCO, is a wetland located 40 km southeast Ho Chi Minh City. The site hasn’t only the diverse ecosystem by mangrove and many rare species but also it has many valuable ecological functions, including coastal stabilization, protection against coastal erosion, oil spills and storm surges. 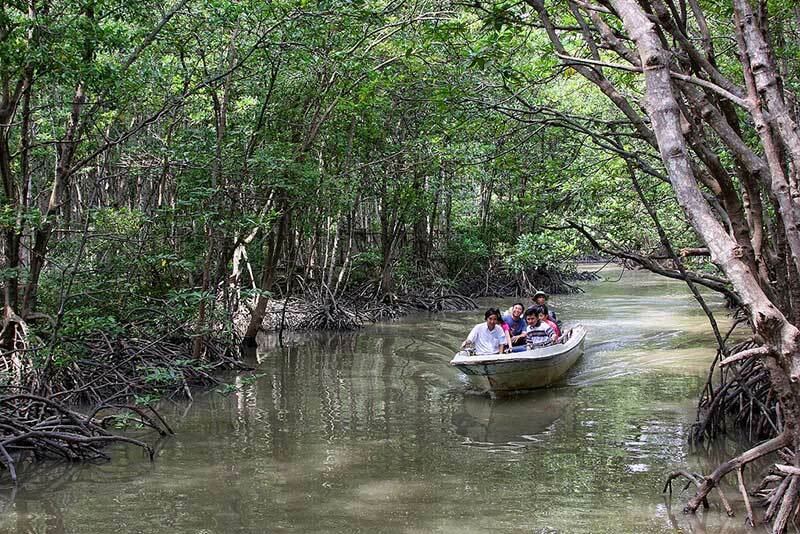 Described as the “Green lungs” of Ho Chi Minh City, Can Gio mangrove forest will bring the new wind to the tourist with its system of canal, its spectacular ocean scenery and its tranquility. When visitors choose Can Gio is the ecotourism destination on the weekend, this is really a wonderful decision because of the combination of beauty, wilderness and adventure of nature. Can Gio Biosphere Reserve will conform to the wishes of many tourists who want to wallow in wild nature and escape from the bursting urban street. With the forest’s area is 75,740 ha together the vital wildlife sanctuary, each month this destination welcomes thousands of travelers to visit and it will definitely become a travel hotspot in the next year. One of the world’s Salt-Marsh biosphere is the Vam Sat Ecological Tourist Area Preserves. Tourists will have an experience journey by the canoe to swampland where rare flying foxes and bats live high in the trees and crabs are caught for their succulent meat. Enjoying the local sport of teasing hungry crocodiles with food from the canoe and floating on a top of a saltwater pool, visitors are truly accompanying in the superb view of nature mother.